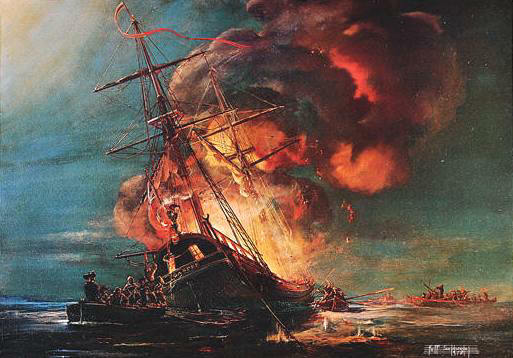 On this day in history, June 9, 1772, the Gaspee Incident occurs near Providence, Rhode Island, when citizens burn the British revenue schooner HMS Gaspee and seize its crew. The Gaspee affair was one of a series of important events that lit the fuse to the American Revolution, but it is little known in comparison with other events such as the Boston Tea Party. To understand the Gaspee Incident, one must understand Rhode Island's unique circumstances before the war. Rhode Island had always been a place of dissidents. It was founded by religious dissenters who were kicked out of Massachusetts for their religious beliefs. Rhode Island was later the first state to declare independence from Britain and the last of the original 13 colonies to accept the Constitution. Because of its unique topography, Rhode Island developed an economy completely based on sea trade, illegal sea trade. Rhode Island is only 35 miles across and 49 miles long, but it has 420 miles of coastland. It has few natural resources, so an illicit trade in slaves, illegal rum and molasses developed. The taxes and trade restrictions of the previous years, including the Sugar Act, the Townshend Acts, and so forth hit Rhode Island's economy square in the face. In 1772, the revenue schooner HMS Gaspee came under the command of Lieutenant William Dudingston. A revenue schooner was charged with boarding suspicious ships to look for smuggled goods and enforcing collection of customs taxes. Lt. Dudingston executed his duties zealously. Many merchants and sailors found their livelihoods threatened by Dudingston's activities. Ships were boarded, goods confiscated and livelihoods ruined. In addition, there was conflict between Dudingston and the popularly elected Royal Governor, Joseph Wanton. Colonists typically viewed revenue officers as under civilian control, but Dudingston was a military officer. The Crown had authorized naval officers to act as customs enforcers, but the colonists didn't like this idea. A series of terse letters was exchanged between Wanton, Dudingston and Dudingston's superior officer, Admiral John Montagu about whether or not Dudingston had the authority to look for "pirates" within Rhode Island waters. On June 9, 1772, Dudingston chased a small packet called the Hannah up Narragansett Bay. When the ships arrived near present day Warwick, the Gaspee became grounded in shallow water. The crew of the Hannah landed in Providence and told the citizens about the Gaspee. Word quickly spread and enterprising citizens realized their chance to exact vengeance on Dudingston had come. Picketers marched up and down Providence's streets telling people to meet at Sabin's Tavern. Led by merchant John Brown, somewhere between 50 and 80 men sailed in longboats that evening, arriving at the Gaspee in the middle of the night. When sentries became aware of their arrival, Lt. Dudingston came out in his night-hat and demanded to know who was there. One of the attackers yelled it was the sheriff and he had come to arrest the crew of the ship for piracy. At that point, one of the attackers fired a single shot that hit Dudingston right in the crotch. The attackers then boarded the ship and took everyone captive. As they left the boat, they set it ablaze. After leaving their prisoners on the shore, the Providence men returned home, but the fire in the boat reached the powder magazine and the ship blew sky high. Not a trace of the ship has ever been found! After the incident, Parliament was outraged and a Royal commission was set up to find the perpetrators and hang them. Even though everyone in Providence knew who was involved, the commission could not find one single person who would give them up! After months of investigating, the commission was forced to give up and the perpetrators never paid for their crime. The Gaspee Incident, also called the Gaspee Affair, was significant because it actually helped promulgate communication between the colonies. Colonists everywhere wanted to know what was happening in Rhode Island because Parliament could do the same things to them no matter where they were. Correspondence flourished between the various Committees of Correspondence set up in different cities as a result of the Gaspee Affair. The same Committees of Correspondence would coordinate the activities of a full blown rebellion that was to begin less than three years away.